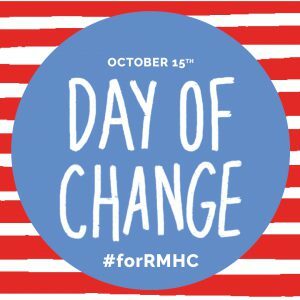 Ronald McDonald House Charities of Alabama is ready to celebrate Day of Change on Monday, October 15! This is the day we celebrate the founding of the very first Ronald McDonald House Charities back in 1979 and how McDonald’s donation boxes are a critical part of our mission. There are 3 different ways you can get involved with Day of Change! Leading up to the day, follow along on our social media as we countdown with some fun videos and photos. 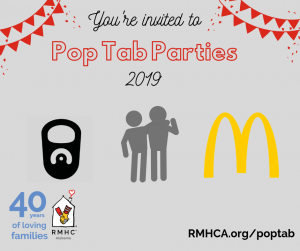 You can follow us on Facebook, Twitter and Instagram @rmhcalabama. Our staff and volunteers will be heading to 10 McDonald’s locations Monday, October 15 from 11 a.m. to 2 p.m. to celebrate Day of Change. At each location, we’ll be thanking supporters with a small gift (while supplies last), sharing our mission with new friends and collecting change with our big red buckets! 3. Collect change at your office, home or place of worship and turn it in at our House in downtown Birmingham. Or make a donation online on October 15.